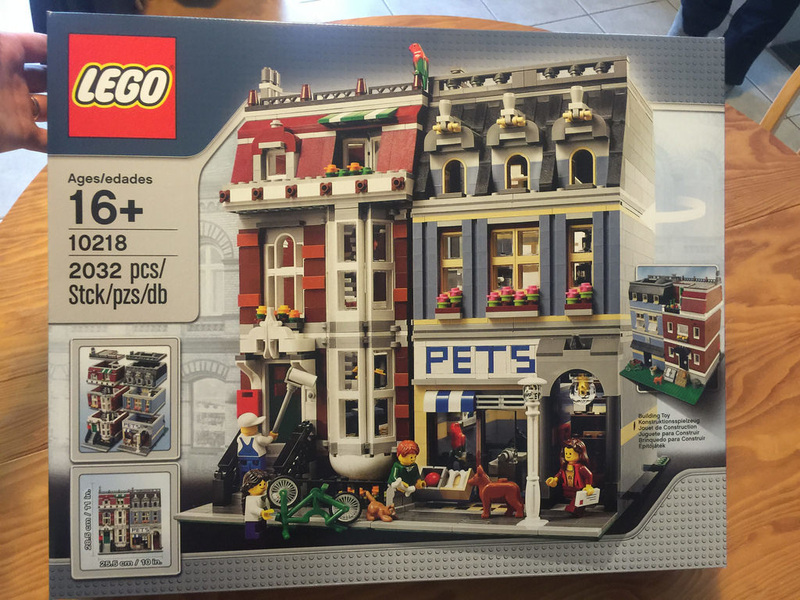 Time to review my second modular – the Pet Shop! 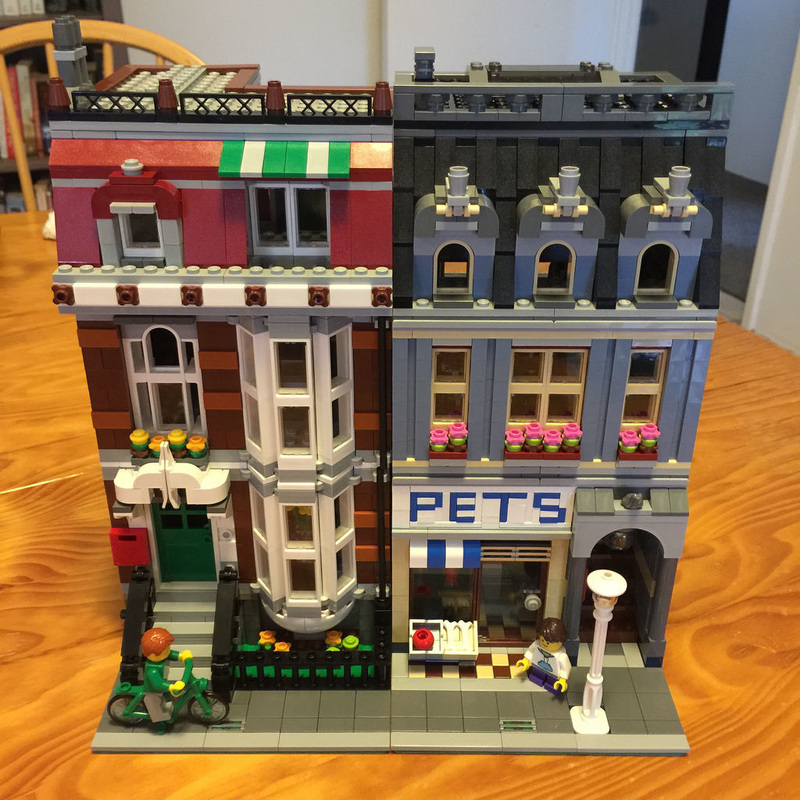 This modular is pretty unique to the modular range, as it’s two complete but separate buildings, each on their own 16×32 baseplate. This way, they are able to be placed in the row separately, or in any order you wish. 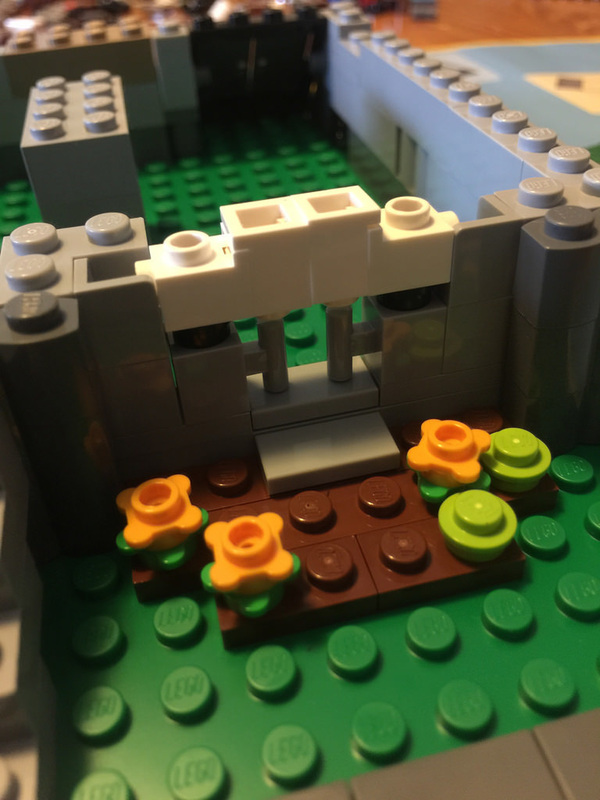 I really like this feature, as you can also use a single building in a MOC if you want. It’s a very versatile set. The houses themselves are a shop front with accommodation at the top, and a brownstone style building that is ready to have someone move in. The painter is putting on a coat of paint, and there are some boxes in the upstairs room ready to go. This build is big. There is plenty to look at in each building, so let’s get stuck into it! Firstly, the contents. 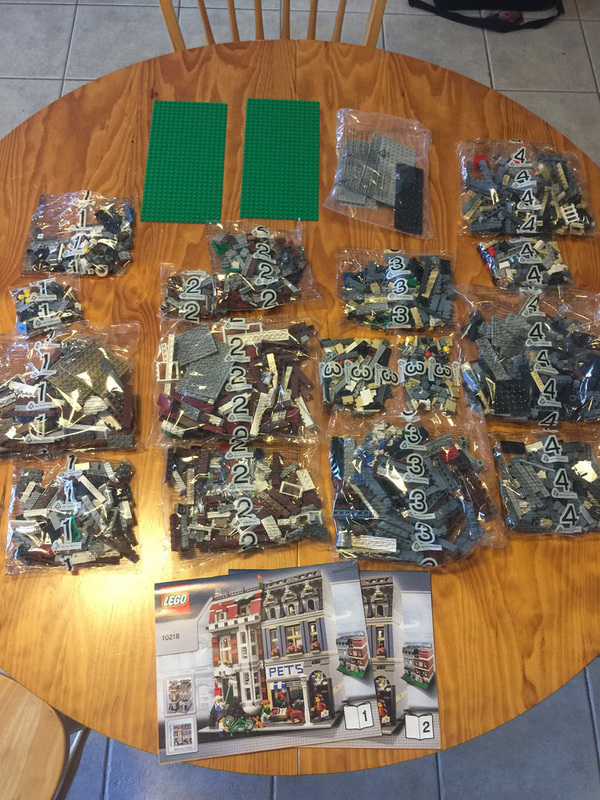 Inside the box you will find 17 bags of parts, two loose 16×32 baseplates in green, and two instruction booklets. This one is chock full of goodies! As with many modulars, the parts are great. 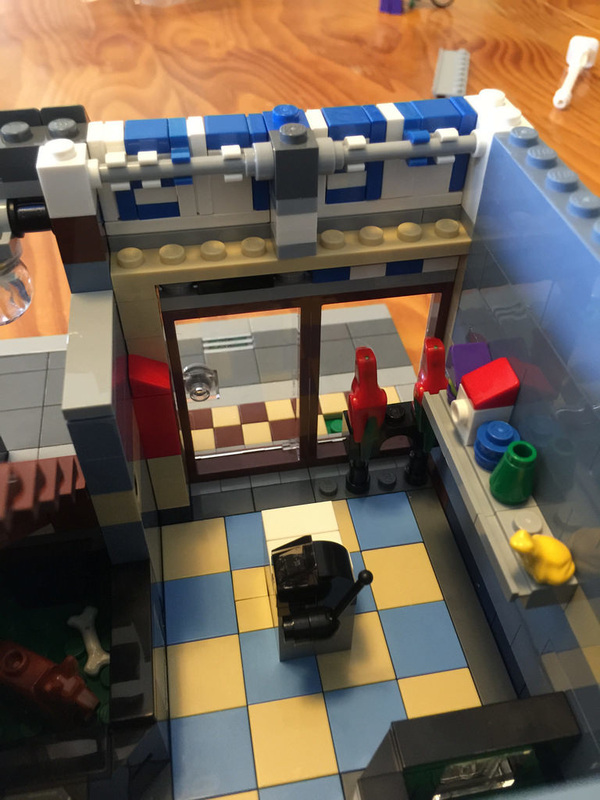 The biggest additions are the plethora of parts in Sand Blue, used to build the majority of the Pet Shop building. You get 1x1s, 1×6 and 1×4 bricks in this part. This set is still the only one in the entire LEGO range to have these in the collection, and they’re great to have. Another part introduced in this set is the bucket, used for some storage at the rear of the Pet Shop. It comes in the metallic silver colour and looks good. A bit big for a minifig to hold, but still good to have. These buckets are extremely rare, as they only appear elsewhere in bright purple in some Friends sets from 2012 and 2013. Other parts rarely seen are the arched top window frames at the top of the Pet Shop building, a pot in white, a bright yellow frog, and more. One difference you may notice is in the fences at the front of the brownstone building. The black fences have actually changed since the image was taken for the box art. The photo shows the fences as the 1x4x2 with 2 knobs variety, but the sets these days come with the 4 knob element. It’s a small thing, but can look a little different. It’s an easy fix with some tiles though, so no major issue. There is just too much else to mention! If I did, I’d be here for a week, so let’s move on to the minifigures. 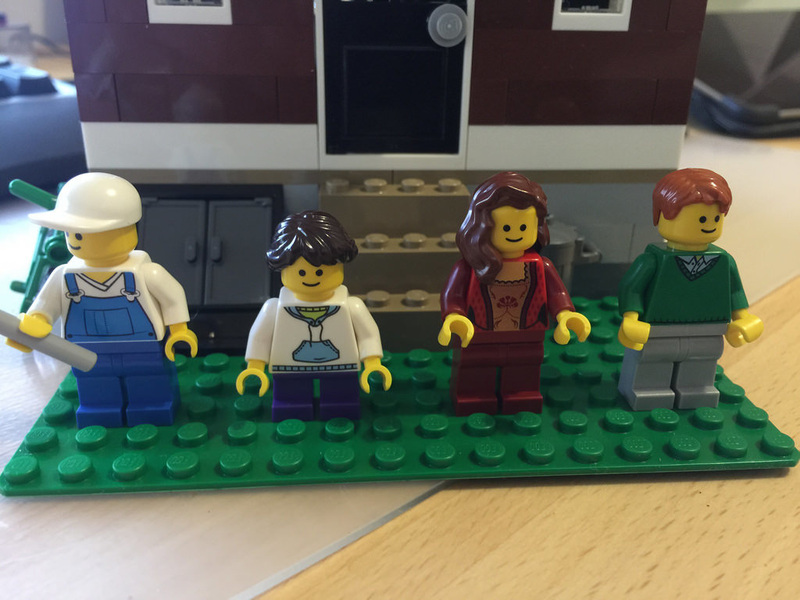 There are 4 minifigures in this set. A bike rider, a painter, a kid and a lady. As with all minifigures with modular sets, the face is the classic one. The minifigures aren’t standout, but they are a good addition to the set. I’m guessing the lady is both the resident of the brownstone, who’s just moving in, and also the Pet Shop sales attendant? Either that or the Pet Shop is unstaffed. Who’s going to feed the animals? I’m not sure about the painter’s paint roller. It looks a little crude, but I guess the roller handle from the Series 10 Decorator didn’t exist yet. 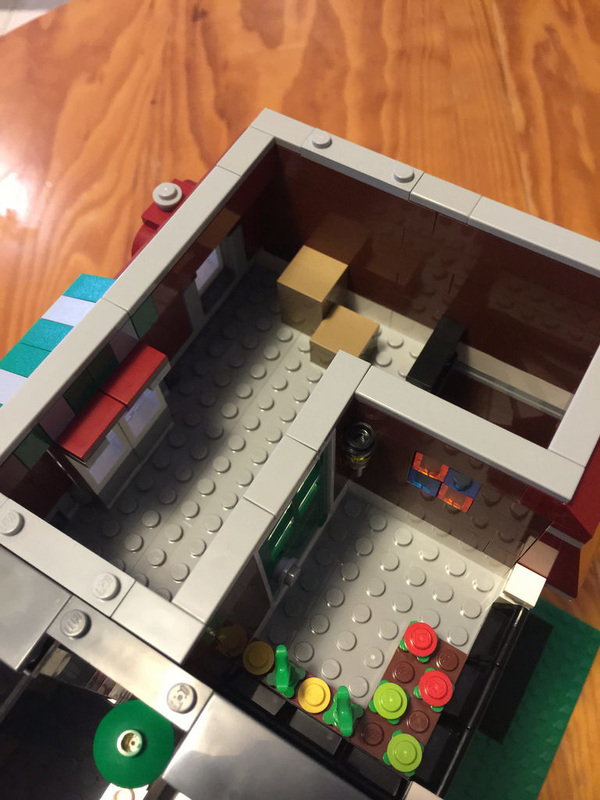 Spares are always a plenty in modulars, and this is no different. Standout items are spare flowers, a green stalk, a bone, and fire, along with loads of 1×1 goodies. 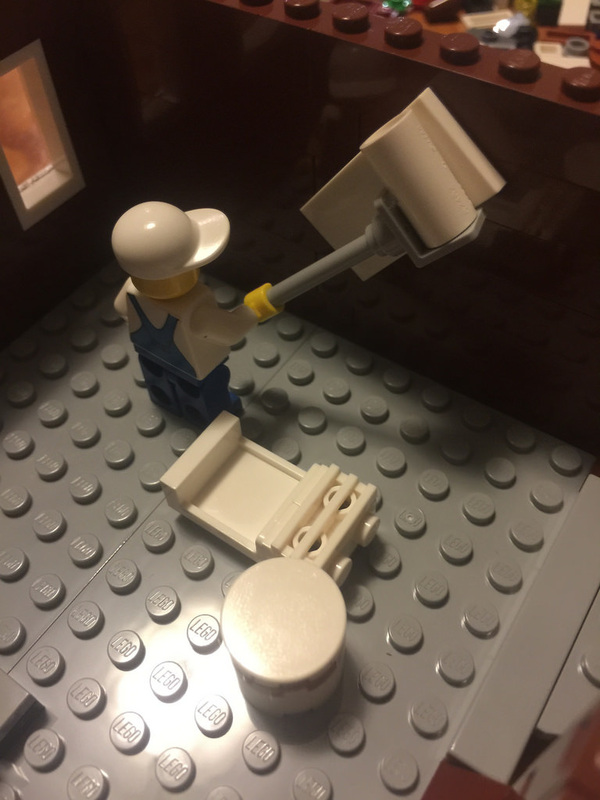 It uses some great SNOT techniques with the always brilliant Erling brick, two 1×1 handle bricks and two 1×1 wall corners. The way this is constructed is really clever and so clean. Once the floor and slanting frame and door is in place, it’s time to add the toilet. 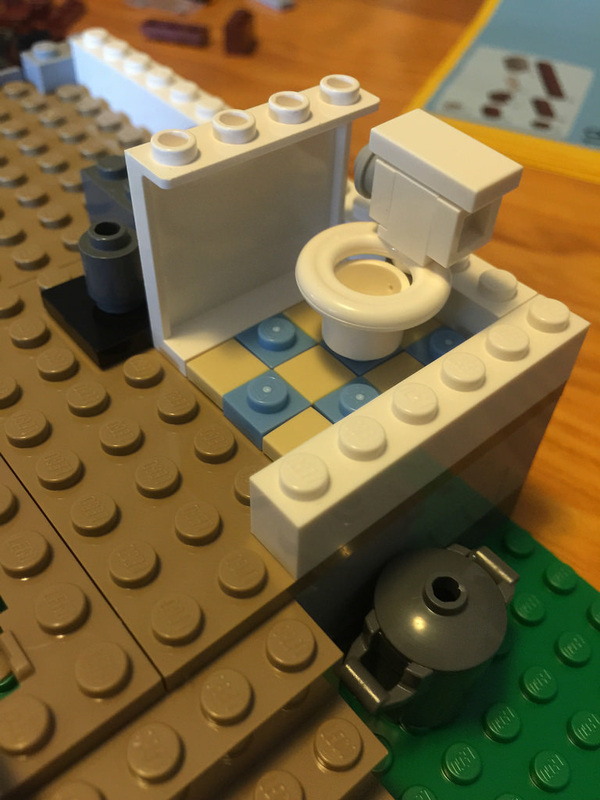 It’s a pretty simple, standard toilet, but uses the white pot I mentioned earlier. It looks really good as a standalone loo. Inside, the furnishings are a bit sparse, with only a couch, and a few side tables around, as well as a hat stand. 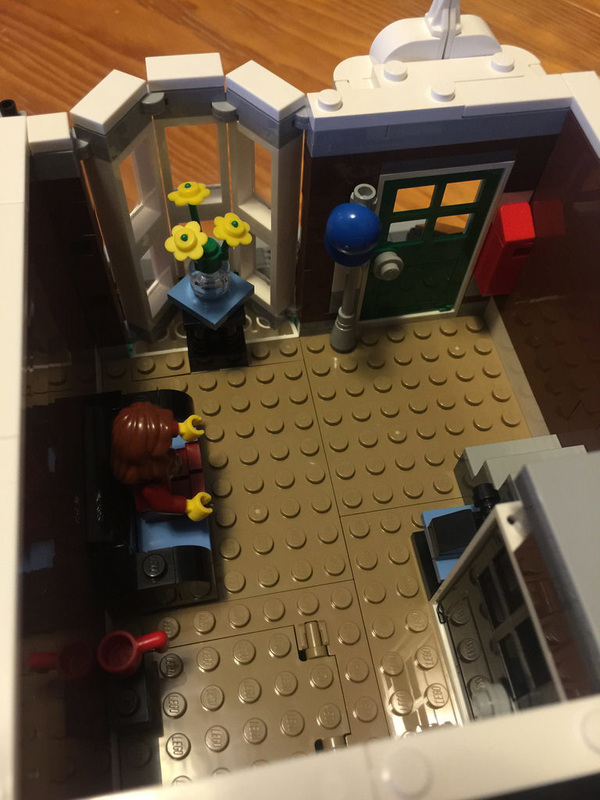 I really like the use of the clear minifigure head as a vase. It looks really effective, especially in the bay window! Also on this floor are the first lot of spiral stairs. They’re a little repetitive to build, but they look really good. It makes good use of the roof area of the toilet. I really like it. The front entrance looks great, with a mailbox built in the wall, with a letter inside, and the greebling on the entry looks superb. I really like the railings for the stairs, and the use of the skis at the top are brilliant. The stairs continue up to the second floor, where it’s very sparse – just a painter painting a wall. I’m a bit disappointed really. I’ll have to build this one up myself. At the top is a smaller room, with some opening windows at the top, with a very small front balcony. There’s also some boxes, a nice little stained glass window, and the best part of the building (in my opinion), a balcony with a vegie garden! It looks really great. It’s inspired me to create a bigger one now as a MOC! The roof is finished off with some basic edging and the top of the smokestack. It looks quite neat all in all. The second building is the blue Pet Shop. As I mentioned before, the sand blue bricks in the building are unique to the set, and you get a fair few of them. The ground floor is the pet shop itself, and it has some great animals and features in it. First, there is a great looking tiled floor. 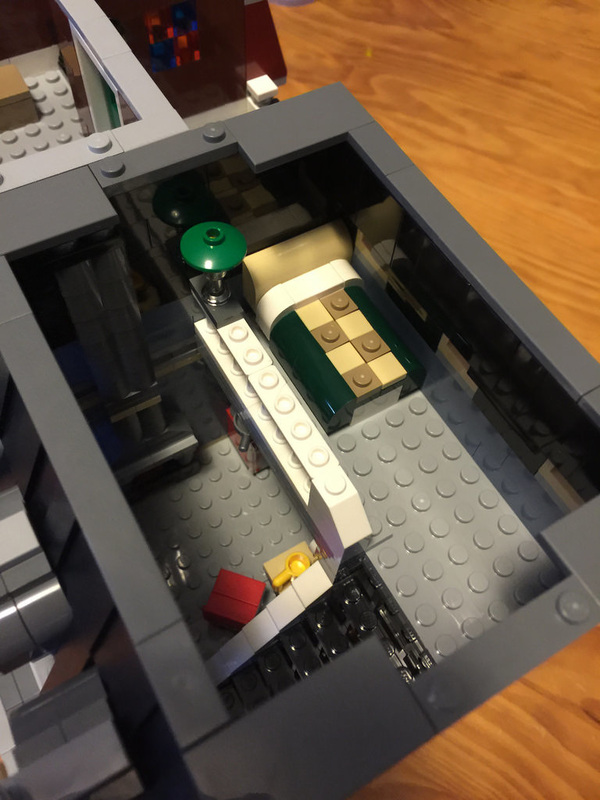 It’s simple, but I really like the tiled floors in my modulars so far. They look really neat, and add so much to the build. 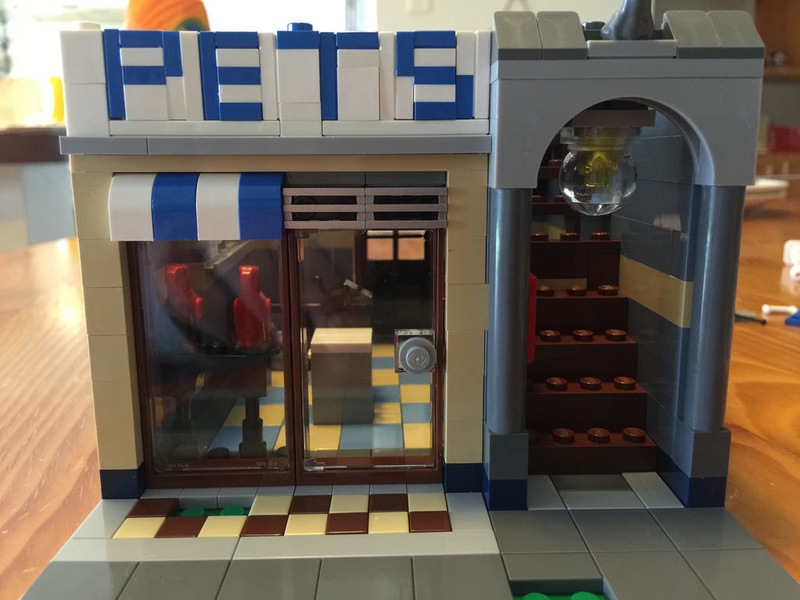 There’s some pet enclosures for a dog, cat, and an aquarium, as well as some birds on a perch in the front, with some toys on a wall mounted shelf, and a cash register in the centre. The front entrance is pretty standard, except for two parts. Firstly, there’s this great light made from an upside-down crystal globe. It looks fantastic, and I’m hoping to be able to light it up somehow soon. Secondly, is the PETS sign. As normal, it’s brick built, and looks fantastic! I always get a kick out of building these. I love them! Outside you will find a couple of boxes. One with a ball, and one with some bones. Out the back is an empty crate and rat. The backs of both buildings are very sparse. Upstairs one floor you will find a very simple kitchen and sitting area, with some stairs going up. I really like the coffee machine in the corner! It’s so simple, but works really well in the space. It’s a little sparse, but there’s always room to put more in. 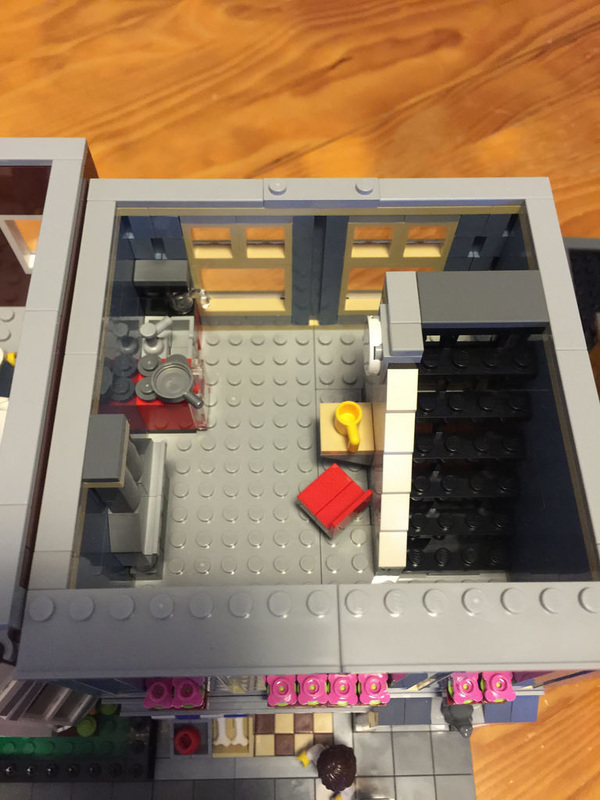 Up another flight of stairs gets you to a half floor / loft kind of space, with a bed and bedside lamp. The bed is great! Not much room to put anything else though. This floor is finished off with a roof, which has a big skylight at the top, and the top of the chimney. I really like the front of this building. The roof looks like black shingles, and the archways and flower beds add some interesting shapes and colour. It’s still a shame the arched window frames don’t have window panes in them. So, a rating for this one. It’s a great build, and is able to be separated, which is awesome. It’s relatively playable, but with not much in the rooms, doesn’t leave all that much to play with. This modular gets 8 out of 10 dog bones. I’ve taken plenty of photos on this set, so if you want more, check them out on Flickr. The next review will be 60057: Camper Van! If you have comments about this review you want to share, please leave them below, and don’t forget to like the site on Facebook! 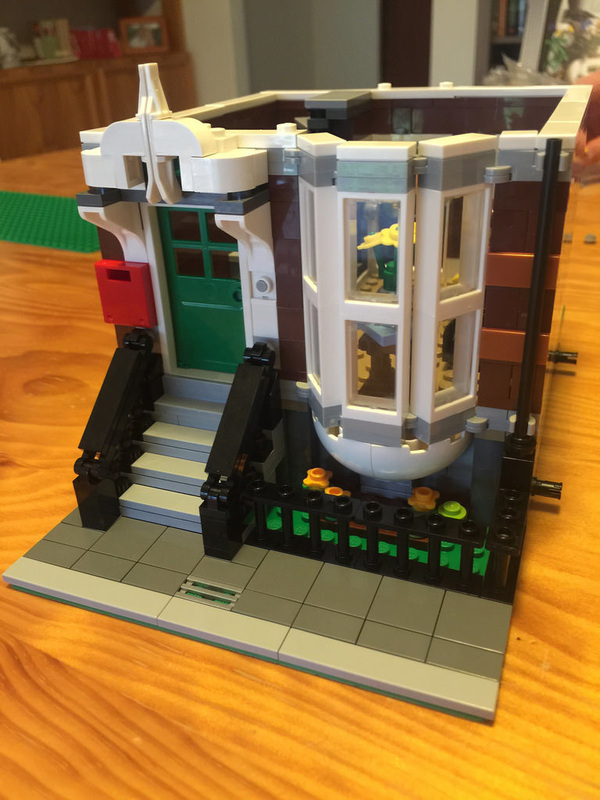 Nice review of a bit older Modular set, which is now as of November 2016 officially retired. Glad I still got a box and saving it for a future build on a rainy Sunday. Wow, your rainy day pile is sounding pretty amazing!